Now living in Switzerland, I have been a professional musician since the age of 22, specialising in providing live music for a wide range of events. I offer a choice of musical formations from solo to 5-piece band and the music I play is a mixture of blues, classic rock, rock & roll, country, folk and light jazz. I sing only in English, covering songs from English & American artists as well as composing & performing my own songs. Among my favourite artists are Eric Clapton, John Fogerty, Steve Earle & John Hiatt. I play acoustic and electric guitars and am an accomplished slide guitar player. I have produced 3 CDs which are available at gigs and in some shops. Besides playing music I also teach guitar and trade in antiques. 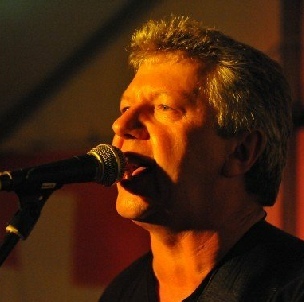 (www.knantik.com) Please read on to find out more about me, my music and my colleagues. Thanks for your interest. 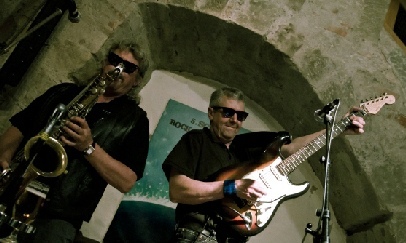 The duo ‘Kevin & Aschi’ with Aschi Beyeler (saxophones, harmonicas) is now the main formation I work with. We met many years ago when Aschi first played with me in ‘The Fun Band’. We share a similar taste in music and the unusual combination of guitar/vocal and sax/harp is complimented by electronic drums & bass specially programmed by me producing a sound emulating that of a full band. As a duo we are very flexible and experienced in playing all kinds of events from concerts in bars & clubs to private parties & corporate functions. We carry a good quality compact sound system and basic lighting. We have played for many events including BEA expo Bern, MUBA Basel, ORBIT Basel, Beaulieau Lausanne, Forum Fribourg, Ferienmesse & Weinmesse Bern, Swiss Hockey awards & Swiss Curling Championships. 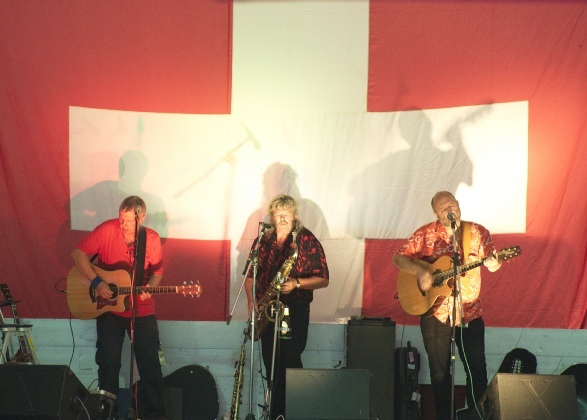 In 2005 we were privileged to be asked by the late Polo Hofer to play for his 60th birthday party and subsequently were part of the inaugural 'Swiss Rock & Blues Cruise'. Outside of Switzerland we have performed in Spain, France, Italy & Germany and in Kosovo for the KFOR peacekeeping force August 1st 2012 Swiss national day celebration.